When I write about restaurants on Instagram, they’re usually brief takes accompanied by a photo or two. (You can see my feed right here on ethnojunkie.com, updated almost daily, by selecting the “Instagram” category from my home page – no signup required.) But because of Instagram’s character count limitations, it’s often necessary to break up a review into several parts. This one originally appeared as six posts, published on April 4 through 10, 2019. On very rare occasion, I venture into a restaurant and know after a few bites that there is no choice but to return and work my way through the entire menu. That’s how the story begins at Boran, 462 Court St in Carroll Gardens, Brooklyn. 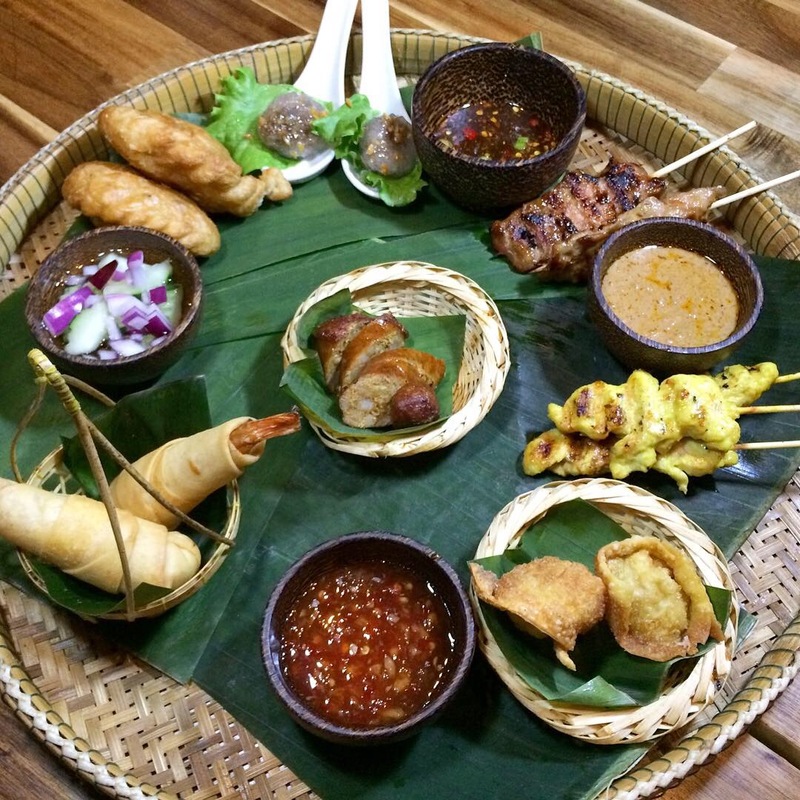 Five of us enjoyed a compelling Thai meal (from multiple regions of Thailand I should add) that started magnificently and kept getting better with each course. Note that the selections I’m covering can be found in the Authentic Style (sometimes identified as “signature”) part of the menu or among the daily specials; they’re not included on the take-out menu or elsewhere on the dine-in menu. There are some foods that are meant to be popped into one’s mouth whole, no biting allowed – Indian pani puri comes to mind. 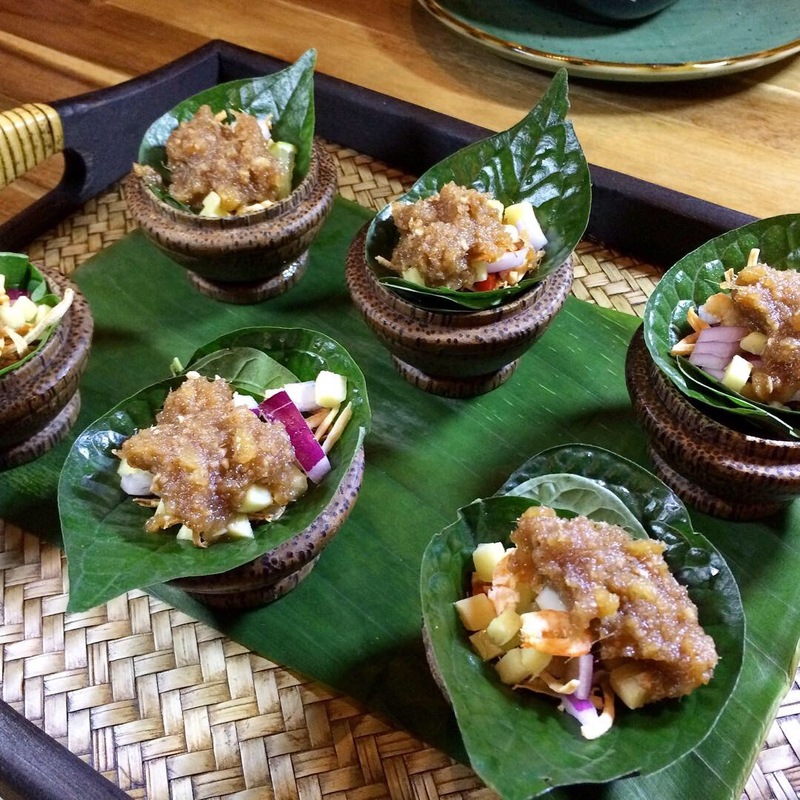 These are Meang Kham: dried shrimp, roasted coconut, roasted peanuts, shallots, ginger, lime and sweet shrimp paste all nestled in a betel leaf; open wide and let the flavors explode in your mouth. This platter featured some universal favorites including chicken satay, grilled honey pork, Northern Thai style sausage (sai oua), and an assortment of tasty fried crispy treats, but a particular delight for me was the Sa Cu Sai Moo (you’ll see alternate spellings elsewhere) shown at the top of the photo reposing in their spoons. I first tasted these pork-filled steamed tapioca dumplings in a Thai restaurant in Manhattan that closed decades ago and have had difficulty finding them since; they’re often available with a peanut filling instead of pork, but that’s just not a moo-ving experience 😉. They’re also available as an appetizer item themselves, not as part of a mixed platter. Definitely try them! Another flavor/texture bomb was Meang Pla Tood, one of their signature dishes: meang (you might see miang) refers to food wrapped in leaves, pla is fish, tood (you might see tod) means deep fried. This is deep fried boneless dorada with cashews and dried shrimp enhanced by ginger, red onion, bits of lime (even the peel) and lemongrass, one of those synergistic devils where the whole definitely exceeds the sum of its parts. 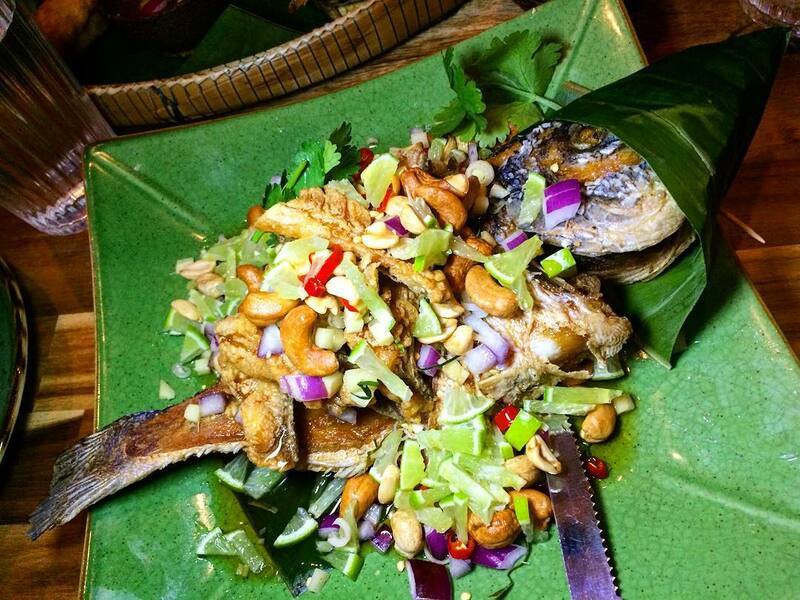 Tasty, incredibly crispy fish and crunchy nuts in a perfect blend of sweet, sour, spicy, salty and bitter condiments that characterizes Thai cuisine. Frankly, this dish blew me away. 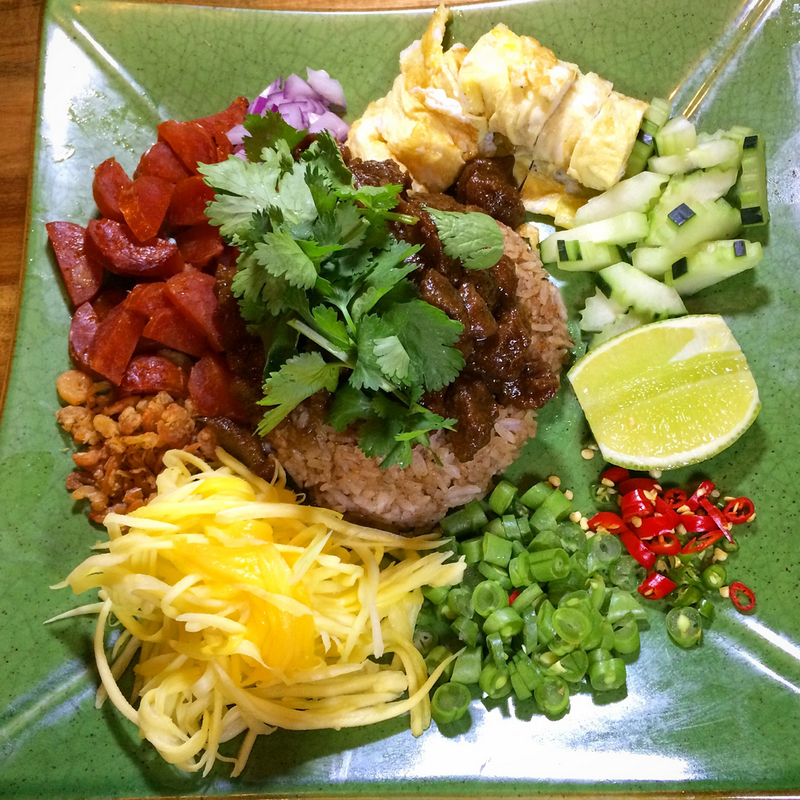 An excellent submission from among Boran’s signature dishes, Khao Knook Gapi Boran. In center stage, shrouded beneath the toss of cilantro, is the soul of this dish: fried rice infused with funky shrimp paste and topped with sweet pork. Decisions to be incorporated ad libitum from twelve o’clock, fried eggs, cucumber, red chilies, bits of pickled long beans, shredded green mango, dried shrimp, chicken sausage and red onion. When you see Nam Prik on a Thai menu, you’re venturing into a fiery zone; it’s a condiment made from roasted red chilies, garlic, shallots, lime juice and fish or shrimp paste. 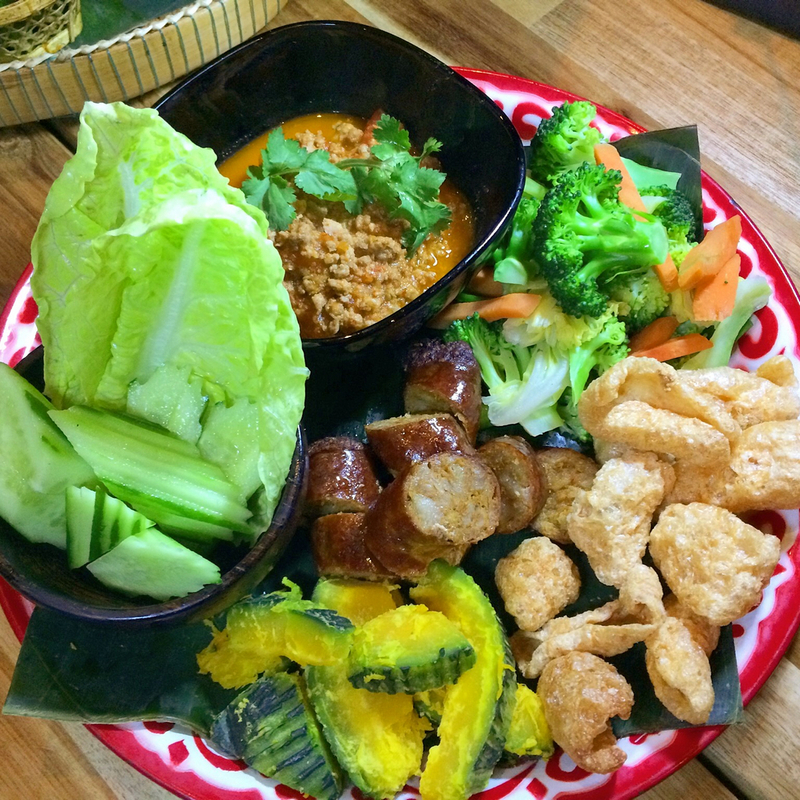 Nam Prik Aong (you might see ong) zooms in on Northern Thailand; the dish adds nam prik to ground pork in a tomato-based sauce and is generally served with cucumber and lettuce for wrapping along with pork cracklings (you might see chicharrones 😉), freshly steamed veggies like broccoli and carrots and sweet kabocha squash. This plate also featured Sai Aua (you might see sai ua), addictive, spicy Northern Thai sausage. 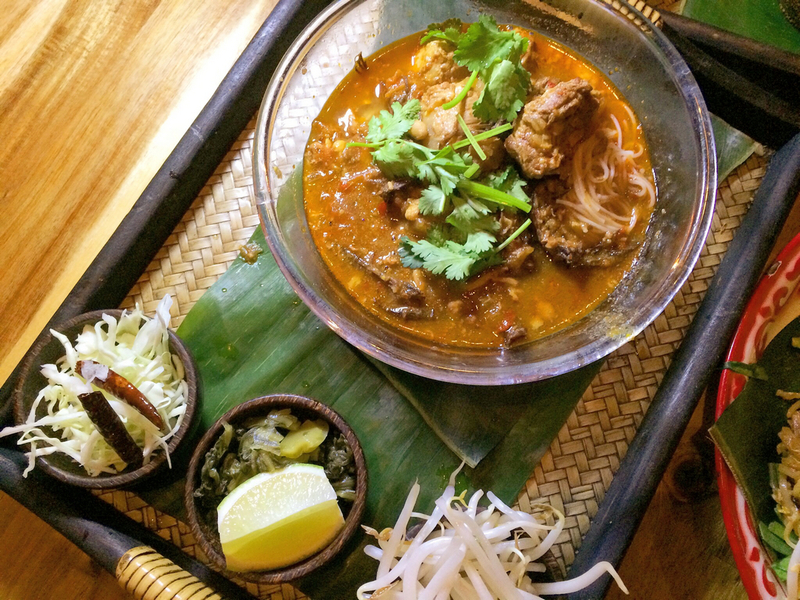 A classic dish from Chiang Mai in Northern Thailand. Vermicelli rice noodles plus pork that’s been simmered in a spicy, garlicky, tart, tomatoey broth (nam means water, liquid, or juice) served with shredded fresh cabbage, bean sprouts and pickled mustard greens. I can’t think of a flavor that was missing. So after all of Boran’s spectacular, authentic, signature dishes I’ve been nattering about, I’ll leave you with just one more: Pad Thai. Now don’t go all anticlimax on me; this is not like any pad thai from your corner we-can-grab-lunch-here restaurant. 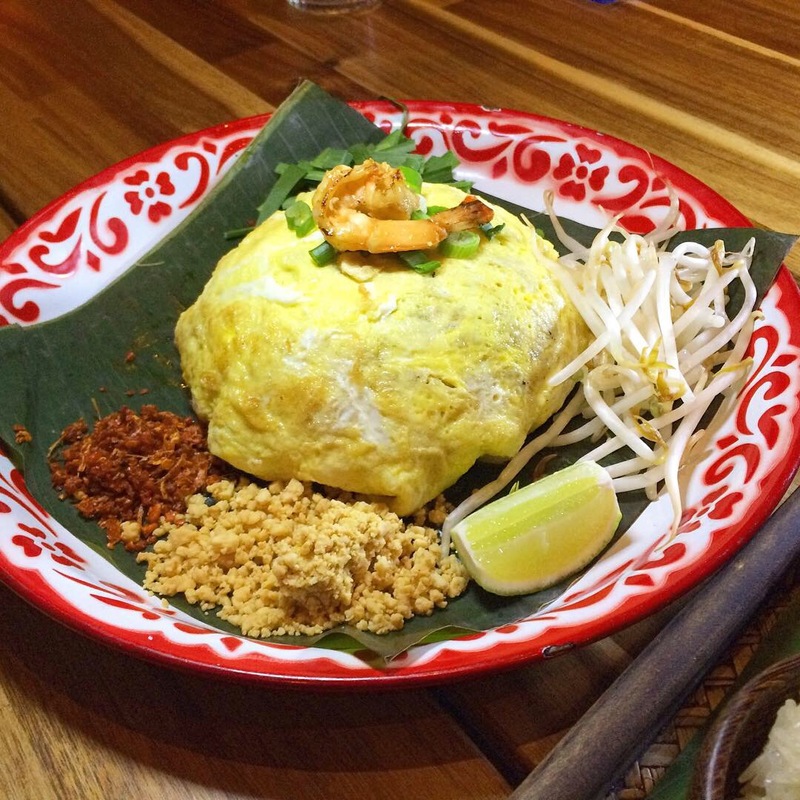 Swaddled in a blanket of thin omelet, the steamy components maintain their heat as the crispy ingredients linger outside waiting for you to fulfill your role: break it open, mix it well, and enjoy it like you’ve never tasted pad thai before. Boran is located at 462 Court St in Carroll Gardens, Brooklyn. 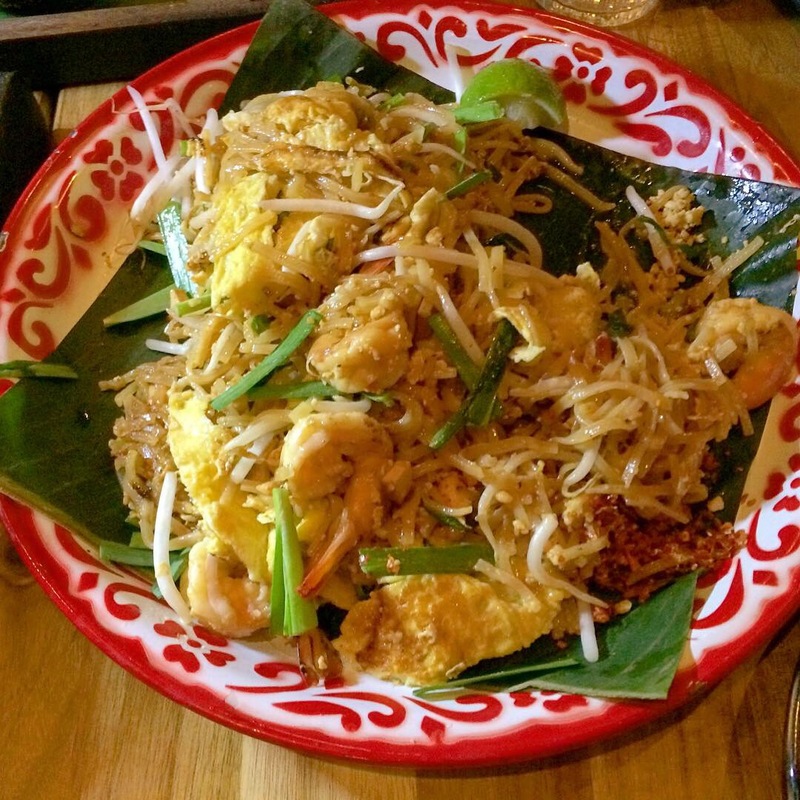 This entry was posted in Instagram, Restaurant Reviews - Extended and tagged Thai by Rich. Bookmark the permalink.